E-mail hoaxers have been trying to stop a new campaign which aims to get people to store next-of-kin details in their mobile phones. 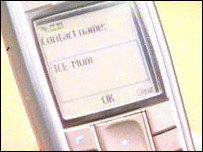 The ICE campaign, which stands for "in case of emergency" was the idea of paramedic Bob Brotchie from Suffolk. The East Anglian Ambulance Trust, which is backing the campaign, said a malicious e-mail has circulated which said that ICE is a mobile phone virus. The Trust has urged people to ignore the hoax e-mail. Matt Ware, spokesman for the Trust, said: "I have been inundated with e-mails and phone calls from people worried that, having put ICE into their mobiles, they are now going to be charged for the privilege. "We would like to assure people that that's not the case. Whoever began this second e-mail is obviously a malicious person with way too much time on their hands."